Being only 21 years old The Muppet Show was before my time. Even its brief revival was before I was old enough to appreciate the subtleties of its humor. Now being old enough, and in sound mind, I can honestly say that The Muppets is the best (non super hero) movie of the year. The plot centers around Walter, a puppet who seems to have been born to a normal human family. He idolizes the Muppets and he and his brother Gary (Jason Segel) are big fans. Walter and Gary are close, even living together well into their adult years. 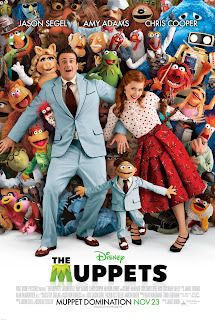 When Gary and his girlfriend of ten years, Mary, (Amy Adams *drool*) decide to go to Los Angeles for their anniversary, they bring Walter along to visit the Muppets Studio. When they arrive they find the place in tatters and Walter deviates from the group to get a private look into Kermit’s old office. While there he accidentally overhears the villain, Tex Richman (Chris Cooper), divulge his secret plans to destroy the studio and drill for oil underneath it. The deal is sealed unless The Muppets can get together the ten million dollars they need to buy the studio back. Together with Mary and Gary he sets out to reunite the Muppets for one last show. Though it’s not easy they eventually do get the gang back together. They also manage to get a TV spot thanks to the hiatus of game/reality show Punch Teacher. The only problem is, they have two days and need to find a celebrity host. Regardless of Kermit’s best efforts everything seems to be going downhill. Miss Piggy takes matters into her own hands and kidnaps Jack Black to be their host. Meanwhile Gary and Mary are having some problems and Mary lays the big question of the movie “Are you a man, or a muppet?” Which leads to what I think is the funniest song in the whole movie. As can be expected everything works out in true Hollywood style. The Muppets keep their studio, Gary gets the girl, Walter is a muppet, and Mahna Mahna. Overall it was a great film. Lots of tongue and cheek jabs at each other, and some times the audience. More than once the fourth wall was broken with hilarious jokes. Popular music and culture were parodied to hilarious effect (Camila and the chickens clucking Ceilo Green’s “Forget You” and a barbershop quartet of Nirvana’s “Smells Like Teen Spirit”) The cameos were solid gold and included the likes of Mickey Rooney, Whoopi Goldberg, John Krasinski, Neil Patrick Harris, Zach Galifianakis, Selena Gomez, and that kid from Modern Family. The story was well done, and Walter’s angle kept the well used plot from feeling tired. 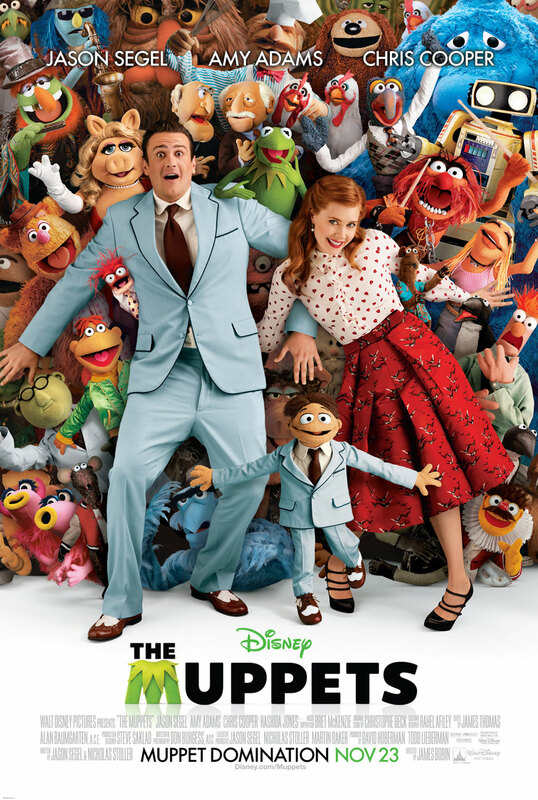 Jason Segel and Amy Adams were great in their chemistry and ability to run with anything the Muppets could throw at them. If I had one complaint, besides the weird whistling noise the was happening in my theater and the small children running around begging to be throttled, was that the very end felt rushed. Not really rushed but more like… tacked on. We get this great cathartic speech from Kermit about how they’ll work their way back up from nothing (seeing as they failed to earn enough money and therefore lost their studio and the rights to their names in a twist reveal from Richman) and they go outside where millions of people are crowding the street outside with signs and cameras and whatnot. Then Richman, upon leaving, takes a blow to the head. Gary proposes to Mary, and instead of saying yes she starts the Mahna Mahna song. In that segment it shows a newspaper caption that says something to the effect of Richman Has a Change of Heart: Blow to the Head Not the Cause. So that’s it. They get their studio and their names. I felt like they wrote the whole movie, realized they’d forgotten that bit of the story, and then just kind of threw that in at the end.